Hindustan Coca-Cola Beverages Pvt Ltd, Indian arm of famous soft drink major Coca-Cola has one of its bottling plants located at the village called Mehdiganj in Uttar Pradesh, India. The village is located about 25 kms from famous and holy city Varanasi. This bottling plant started its operation since 1999. The local villagers and the people from the surrounding areas have been fighting against the plant since its inception. People alleged that the bottling plant uses unjust practices of ground water extraction . Due to severe extraction of ground water, the water level in the area has gone down. 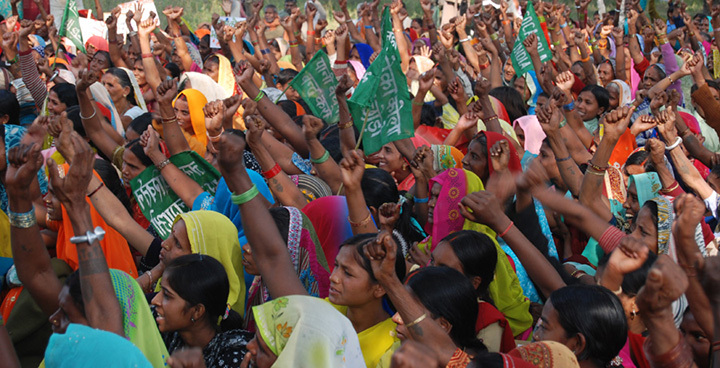 The local community in and around Mehdiganj rely heavily on the same groundwater to meet all their water needs, including drinking, cooking, cleaning, providing water for livestock, as well as agriculture  The protestors alleged that beside the ground water extraction, the chemical waste discharged by the plant into the nearby land destroy crops and soil. It is a matter of serious concern for the local villagers. Beside the above two issues, the protestors alleged that the plant has also occupied the local panchayat (community) land without paying any tax. Although there are enough evidences of such concerns the company denied all above allegations . Looking at the indifference from both the company and the government the people of Mehdiganj started an indefinite Dharna (sit in protest) infront of the coke plant on 23rd March 2006 . In 2006, the protest including hunger strike lasted for over three months. The activist demanded the permanent closure of the unit. The bottling plant has been ordered to stop operation in June 2014 by the UP Pollution Control Board. The company appealed against the closure order to the National Green Tribunal . The NGT has given a stay on the order of the board and ordered the company to limit its production up to 600 bottles per minute. The company will not be able to increase production capacity till it gets a clearance from the Central Ground Water Authority (CGWA) . Project Details Hindustan Coca-Cola Beverages Pvt Ltd, the bottling arm of Coca-Cola has about 58 bottling factories in India. Mehandiganj plant is one of the bottling plants of the company. It is a single-line facility and the only glass bottles unit. With an estimated 26,500 kiloliters of beverage production per year, this used to be one of the smallest Coca-Cola factories in India. In Mehdiganj, Coca-Cola has extracted nearly a million liters of water every day. Due to this over extraction, groundwater levels in Mehdiganj have dropped 7.9 meters (26 feet) in the 11 years after the plant was established . In 2013, Coca-Cola announced that the expansion of the plant. With the proposed expansion, the plant could produce 600 polyethylene terephthalate (PET) bottles of soft drinks per minute . 2. Compensation for the people who lost their livelihood because of depleted groundwater and the pollution caused by the plant. Why? Explain briefly. In 2012, in a survey conducted by the Central Ground Water Board of India confirmed the community claims that groundwater levels have dropped sharply ever since Coca-Cola began operations in Mehdiganj in 1999. Wells in the villages started to run dry, water hand pumps stopped working and ponds in the area also dried up . In early 2014, the Uttar Pradesh government realized the ill effect of the coca cola plant. Government officials also found that the plant had been built on the land belonging to the local village council and therefore the construction was “illegal.” Authorities have also imposed a nominal 126,000 rupee ($2,000) fine on the company over the land issue . In June 2014 UP Pollution control board ordered the closure of a Coca-Cola bottling plant at the centre of protests that it is extracting too much groundwater . However in the same month the plant resume operations following an order from the National Green Tribunal (NGT). The NGT has given a stay on the order of the Uttar Pradesh Pollution Control Board that directed the company to close the factory. However, NGT limited the protection of the plant to about 600 bottles per minute .